Parents with newborns who live in a dry climate or in a region where it gets cold enough in the winter to require extended use of heat in their homes should consider purchasing a humidifier for their baby's room. Humidifiers can also be effective as an alternative to over-the-counter cough and cold products, since the FDA recommends against giving OTC medicines to newborns. When choosing a humidifier for a newborn, consider a few important factors. According to Dr. William Sears, well-known pediatrician and author, it's incredibly important for newborns to breathe clean air. It's also a good idea to make sure that the air a newborn is breathing is not too dry. In environments where the air is dry, a newborn's breathing passages may begin to develop lines -- and possibly globs -- of mucus that could eventually lead to a respiratory infection. Viruses also grow more easily in drier air. 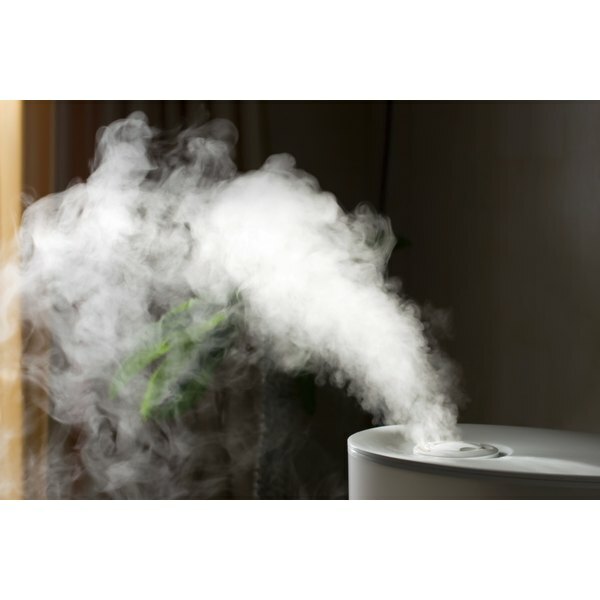 Therefore, look for a humidifier that introduces moisture into the air by producing a fine mist. Newer ultrasonic humidifiers, some of which produce small vapor particles in addition to breaking water particles into a mist, are the best choice for newborns, says Sears. Though viruses can grow more easily and survive for a longer period of time in cold air, the American Academy of Pediatrics recommends against the use of warm-mist humidifiers and hot-water vaporizers. The organization suggests using a cool-mist humidifier in a baby's room to help prevent the buildup of nasal secretions. A cool-mist humidifier should be placed close to a baby's crib or bassinet but far enough away that there are no safety concerns. As baby grows into a curious toddler, having a cool-mist humidifier -- as opposed to a warm-mist model or vaporizer -- reduces the risk of accidental burns or scalding. A number of manufacturers make cool-mist humidifiers that come in the shape of animals such as frogs, pigs or penguins. While it may be tempting to purchase a humidifier that matches the theme or color scheme of the baby's room, keep in mind that a cute humidifier could be mistaken as a toy to a baby. As a newborn grows and begins to explore, she might try to play with a humidifier and cause it to spill or fall and injure her. It's a good idea to get a humidifier that can't be mistaken for a toy and place it out of a baby's reach. According to the AAP, humidifiers should be cleaned and dried thoroughly each day to prevent bacterial or mold contamination. Therefore, when considering a humidifier for a baby's room, examine the accessibility of parts that need to be cleaned, including the water tank, filter and other interior surfaces. Some humidifier models include antimicrobial technology that has been shown to be effective in reducing bacterial growth in the tank and base of the humidifier. Be sure to clean and dry your humidifier according to the manufacturer's instructions. Parenting: Ask Dr. Sears, Humidifiers or Vaporizers?